The Bulle MOLLE size 2 utility zip bag is a flat utility pouch with MOLLE webbing on both front and rear sides. This makes for a highly modular pouch that is stackable on the MOLLE base, either with another utility zip bag, or with other types of MOLLE pouches. The utility zip bag provides flat storage space for maps, pens, wallets, keys and other essential personal items which may not necessarily have to be carried on the front chest. The utility zip bag is flat enough to be worn inside a trouser leg pocket and helps to keep heavy items that might otherwise chafe together. The size 2 utility zip bag measures 22cm wide by 16cm tall and 4cm deep. It has two rivetted drainage holes at the bottom and is closed at the top with a YKK branded double zipper. The zip pulls are made of nylon cord terminating in UTX-Flex ends. This eliminates noise associated with traditional metal pulls. A loop of nylon cord is provided at the top so that important items such as keys and carabiners may be hooked into the top to prevent mixing up of contents. Two fully detachable MOLLE mounting straps are provided. Made of 1000D texturised Cordura. Price is for one panel only. Any accessories shown are for illustration purposes and are not included with the bag. 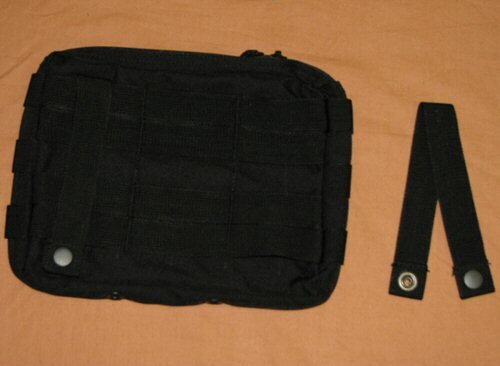 Rear view of the utility pouch. 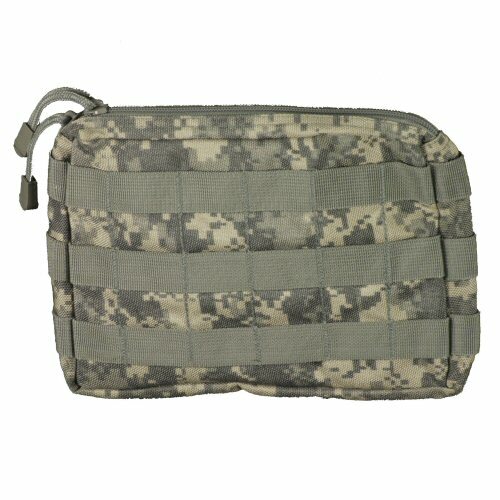 There are two strips of molle loops on this pouch which allows for maximum strength fitting. Also note that the fixing strap is removable so the pouch can be mounted at varying height, and even upside down, without compromising the strength of the fitting.